I see a decent amount of picture books, and I only review the ones that have garnered a strong reaction from me  either positive or negative. I love to share the funny or lovely books I have run across, and I feel compelled to warn you against the sappy or crappy books I have had to read. 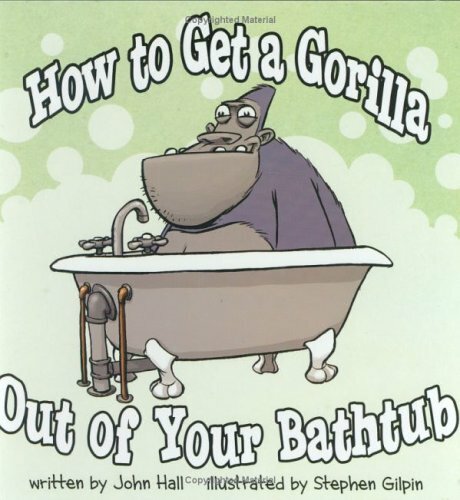 And then there is John Hall’s How to Get a Gorilla Out of Your Bathtub. I don’t know how I feel about this book. It’s funny... yet, in such a strange way, it’s not grabbing me. And I like strange. Basically, the girl in the story instructs us the readers as to the techniques for getting a gorilla out of your bathtub. A trail of bananas won’t work, because gorillas like bathtubs better. Wrapping a rope around the gorilla’s tummy will remind him of being tangled in a bowl of spaghetti. What? It just gets more surreal from that point. When I went to Amazon to see what reviewers thought of this book, there were no professional reviews. Huh. What’s more, of the people who had been to that page only one percent ended up buying that book. One percent. So, it doesn’t seem to be hitting other people as a must-have purchase either. In summary, kudos to the author for thinking out of the box in children’s picture books. However, I am not sure I am ready for How to Get a Pickle Out of Your Ear or How to Get a Pancake Out of Your CD Player. But do let me know if How to Get an Idiot Out of the White House gets published. I love "How To Get A Gorilla Out Of Your Bathtub"! More importantly, my KIDS LOVE IT :) I"ve lost count of how many times they've asked me to read it to them - but it's more than any other book they own. But much more important to me as a parent, is that every time I read it to them, it is reinforcing using the word "please" - which is a habit I so want my children to have! You really missed it on "How To Get A Gorilla Out Of Your Bathtub". This book has been nominated for the Bill Martin Jr. Picture Book Award for 2009 - meaning the committee thought it was one of the 12 best picture books in the world in 2008. Who needs "professional reviews" when a book is selling thousands of copies and still hasn't peaked. And you can buy it directly from the publisher a lot cheaper than on Amazon. Gotta love anonymous comments -- three in a row, no less -- on a three-year-old post. That's credibility for ya! Wow. I reviewed a book on a quick impression three years ago, and now I'm hearing about it. So, all right. 4. Bloggers don't go back an update links in posts. It isn't feasible. The links are a courtesy in any case, since anyone who has figured out how to get to this book in my three year old post, must certainly be able to figure out how to get to Amazon. 3. I couldn't find the book with the publisher, much less cheaper. And who goes to the publisher to buy a book? Unless it some speciality catalog publisher - which it appears to be. 2. It's wonderful that it was nominated for an award given by the Kansas Reading Association. Many of the books in the list are good books, but I honestly can't say that it's a strong selection. 1. Perhaps I missed the point in it being the narrator giving the instructions not the girl. Perhaps that changes the whole thing. Or, it could be that I don't enjoy books that set up a wacky concept and then go through a bunch of other wacky ideas to get across a final Message. Other people are certainly entitled to their opinions - even when they feel so strongly about them that they feel the need to comment on a three year old post. I totally agree with you. It is a strange book and none of my +300 students "got it". It sits on the shelf. It made me rethink the if it gets an award it must be worth buying concept. No this should not have won an award. It seems to throw the "thank you" and please part at the very end thus to my mind it did not reinforce "please". I would rather have seen different situations where please got a wonderful response. So I am not a fan of the title. Of course to each their own. I just think you were spot on.